Well, I talked Dear Hubby into joining me for Rudy Day! 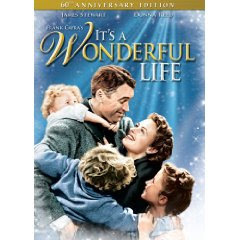 We watched It's a Wonderful Life....one of his favorites. I addressed our Christmas cards. We discussed how to sign them this year. The Wild One has moved back home but she is 28 years old. So do we include her? Do we include any adult children that aren't married or do we just include the ones living at home or do we just put the two of us? Decisions, decisions...... We finally settled on anyone living in the house. Us, two adult children, the two new dogs and the cat! Then on to the picture dilemma. I really want a picture of our two new boys (the chocolate labs) with reindeer antlers or Santa hats but could we really get them to sit still for that? What about the dogs and the cat? HA, they don't exactly see eye to eye yet. I also finished the first row from my new Block of the Month Christmas pattern. This was an easy row. Next month and November are each rows of paper pieced trees and houses with lots of little pieces. Hope everyone had a productive Rudy Day. It was really nice to include Dear Hubby with me this time. I have a plan for tomorrow that I hope works out. Still haven't 100% convinced Dear Hubby that he needs to join me in the Rudy Day festivities but I'm wearing him down! Back in August, I won a BOM quilt pattern from Paula the Quilter. I have it all planned out so that if I start this month, I will have the top finished next July. Just in time to get it quilted and the binding on for next Christmas. So far so good. Only 6 days left in the month and I am almost finished the September block. All the units are made......just have to put them together and set in the center square. I haven't set in a piece in quite a while so that may take a little longer. There are 8 of these blocks but in different colors. Obviously they went somewhere without me! Well, you know that I have been posting more on my other blog. 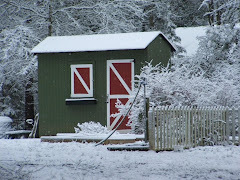 I have been in a little of a Christmas funk lately and I am sure it had something to do with the weather. Just couldn't get in the Christmas spirit. But now I am back and ready to get going. Here is the shortened version of what I have planned to do each month. You can go back to a post I wrote last April to find the detailed list. Anyway, I haven't kept up with it too well this year. Since Rudy Day is on a Friday this month, I think I can get caught up with most of it over the weekend. I really only need to do July, August and September. Dear Hubby does NOT have a football game that night. For some reason they moved it to Thursday. He will be home with me but I think I can talk him into watching a Christmas movie. I may even be able to talk him into helping me with the cards and the baking/menu lists if I bribe him with something chocolatey! I have been working on some crafty things. The pattern is "Christmas Morning" by Cheri-Saffiote Payne but I changed the muslin block to applique (she had a stitchery) and have renamed the quilt "HoHoHo". These three quilts have been tops for more years than I want to say outloud! All of them just need a little quilting and binding. I think I will move these guys up the quilting ladder, so to speak, and see if I can't get them quilted before Christmas! What are you doing this Rudy Day? Only 8 days to decide!